Our services are absolutely confidential, tailored to your individual needs and recovery goals, and they are offered in the environment that best suits you. Service Access to Recovery (SAR) is the gateway to addiction treatment in the Ottawa area. This is a starting point for people 16 years of age and older who are concerned about substance use and want to understand and discuss treatment options. SAR navigators provide assessments of addiction problems and build need profiles to refer you directly to the program that best suits you, based on your recovery expectations. People under 16 who use opioids will be assessed and referred as a priority (parents can call to start the assessment and referral process). Since our access service is funded by the Local Health Integration Network (LHIN), it provides access to care that is free for Ontario residents, although the Ontario health care card may be required to access some of the agencies to which we may refer you. SAR navigators will offer information to you and your relatives, and will provide help and support while you are waiting to start the treatment that was referred to you. SAR gives you priority access to a nurse practitioner who is an expert in addiction and mental health, and will assess your health needs and prescribe the appropriate treatment. The SAR navigator and the nurse practitioner are bilingual professionals and will welcome you in one of the two official languages, ​​according to your preference. 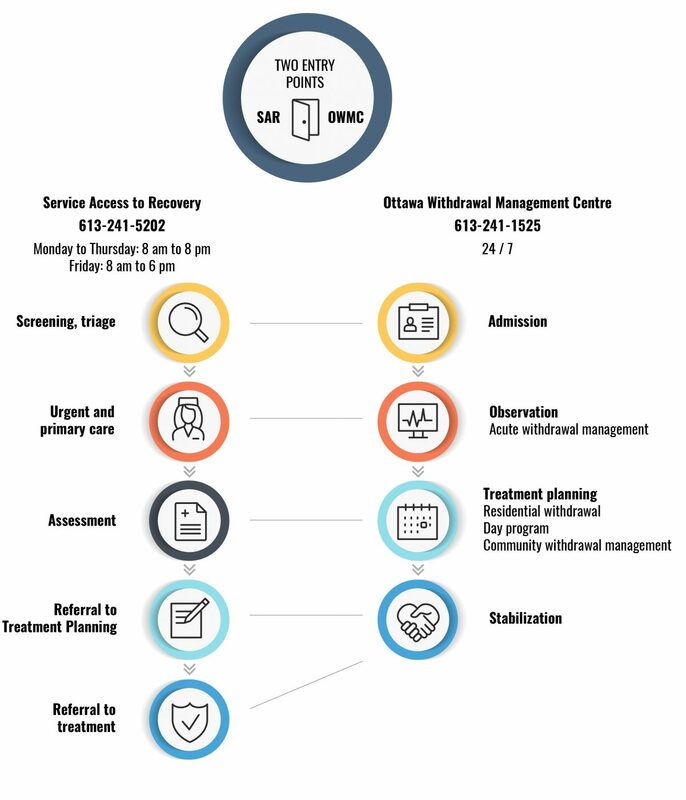 The Ottawa Withdrawal Management Centre offers a range of services to help individuals struggling with a substance abuse problem. We offer non-medical withdrawal management services in a respectful and safe residential environment. The individuals receive help to make changes in their use of substances, in order to reduce the negative effects on their health. Our withdrawal management counsellors are available to speak with you 24 hours a day, 7 days a week. They can answer your questions and offer information about our services. We offer three different withdrawal management programs to suit different needs and lifestyles. Residential Withdrawal Management, offered at our Withdrawal Management Centre, is a short-term residential service for people who need 24-hour monitoring or a structured, safe environment in order to stop using. The Day Withdrawal Management Program is for individuals who want to start their recovery process in a group format over a two or three week period. In the Community Withdrawal Management Program, counsellors support individuals who would rather withdraw from their substances in their own home or another safe and supportive environment. Make a list of the pros and cons of withdrawing. One of the first steps towards changing your drug use is to be certain you want to change. Think about how you will spend your leisure time when you’re no longer using your substance. What activities would you like to take up? Boredom can be a trigger to use substances, so start planning to fill your free time with activities. Start a journal. Journaling is a helpful way to record your progress in recovery. Practice saying “no.” One of the highest-risk situations after withdrawal is being offered drugs or alcohol. Saying “no” requires practice. Learn to reward yourself in other ways. In the past, you were perhaps using at the end of the day or on special occasions as a form of treat or reward. You’ll need to develop a different reward system. We can put you directly in touch with additional resources to help with your long-term recovery. See our Resources page for more information.